Best Serbian tennis players, Jelena Janković and Ana Ivanović, participated in this year’s tournament, which takes place in Tokyo. Ms. Janković won the second place after the match with Maria Sharapova last year at the same event (see the link: Serbian Tennis Women Players Jelena Jankovic and Ana Ivanovic took part in 26th PPO Tennis Tournament in Tokyo, September 23-October 3). 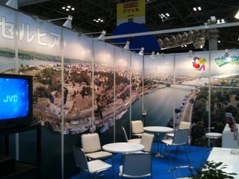 For the fifth consecutive year Serbia was participating at the JATA World Tourism Congress & Travel Fair at Tokyo Big Sight (http://www.jata-wtf.com), which is one of the biggest international fairs in Asia. Ambassador Mrkić and Third Secretary Ms. Kovač attended the opening reception on the first day, along with the great number of Japanese high officials and tourism agencies, media and diplomatic corps. 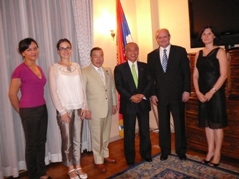 The representatives of the Tourism Organization of Serbia (TOS), Mr. Predrag Rolović, and of the Tourism Organization of Belgrade (TOB), Mr. Saša Stevanović, introduced diverse touristic offers from Serbia and various brochures in Japanese language. With the support by the main organizer JATA, our turism representatives participated at the seminar on Balkan countries, where the Japanese tour-operators presented their report from the visit to Serbia and other countries in May this year. TOS associate, Mr. Hisashi Yamazaki Vukelić, also had the opportunity to introduce the tourist strategy and priorities of Serbia in Japanese language. Serbian delegation from National Folk Ensemble "Kolo" (www.kolo.rs), headed by Director Radojica Kuzmanović, are participating in various workshops and seminars about Serbian traditional dance. This is the continuation of the cooperation with Mr. Tetsuo Masunaga from Japanese company "Folklore Report", which was highlighted in February and March this year with "Kolo" tour around Japan. We had the pleasure of hosting a dinner in the honor of MP, Honorable Muneo Suzuki, who visited our Embassy with Mr. Masataka Ota, member of the City Parliament of Yokohama. While enjoying famous Serbian cuisine and wine, our distinguished guests exchanged some views with their host, Ambassador Mrkic, and his associates on the bilateral relations between Serbia and Japan and possibilities for their further strenghtening. We had the pleasure to meet the students from Kanazu – Tsunoda City Junior High School, Miyagi prefecture, visiting our Embassy for the first time. It was a great opportunity to deepen cultural exchange between our two countries and present some interesting facts about Serbian customs, history, tourism attractions and education system to our young guests.